Now I’ve properly moved into my new studio in Pontefract, and had my open evening to give people the chance to visit/see my tactile, sculptural and unique 3D Acrylic Paintings, it’s time to get to work making more to show you. Since part of the reason for needing the studio space was to give myself some room to work away from my ever so cute but not so helpful cats it made sense to me that the first pieces I made there was of them. Here’s how I made them from cardboard and modroc…. I started drawing Dexter on the cardboard but decided that I wanted him to be further across. The good thing about doing it on cardboard is that rather than having to rub it all out and drawing it again to move it across I could just cut the cardboard and move it to the other side to extend it across to where I wanted it. Final details getting painted on the Dexter 3D Acrylic Painting. It took me a couple of goes to get the eyes right. I wasn’t quite happy with them at first so I had another go at it. Just needs a background painting on next. Lots more details painted on the Damien 3D Acrylic Painting, it took quite a while to get to this point from the last one. The markings were tricky to get right but I finally managed to get them so I was happy with how they were looking. Background painted on the Damien 3D Acrylic Painting and that’s it finished, just needs to dry and get varnished. In case you were wondering why there’s only 2 paintings when I have 3 cats Naughty Norman fluffycat had his picture done while I was still in the pop up shop in Castleford a year or so ago. I’ve been meaning to get round to making Dexter and Damien theirs and now seemed like the perfect opportunity. I wrote a blog post earlier this year about working on my “Make Your Own” Kits, if you haven’t read it yet you can do so here. I’ve been working on the instructions to go in them, this is what I’ve got so far, if you have any suggestions of things to add/change etc then please let me know. Draw out your design onto the cardboard. Cut all along the outside edge of your design. Decide which bits of your image are going to be made more 3D and cut these sections out of the main image. Use the cut out bits as a template to make more of the same shape to layered up on top of each other. (For example if you were making a 3D painting of a dog you could make the head more 3D than the rest by cutting the head away from the body, drawing round the cut out head shape onto another bit of cardboard then cutting that out so you then have 2 head shaped bits of cardboard to use. NOTE: You may need to get more cardboard if you choose to do more layers than the provided cardboard will allow. The modroc included may not cover it all if the layers go too high so please keep this in mind. Stick your cut out cardboard pieces together then stick it all onto the blank canvas. NOTE: You may want to try positioning it on the canvas before you put the glue on so you’re happy with where it’s going to go. Once the glue is dry lay the dry modroc over the top of the cardboard image to make sure it will fit. Cut any overlapping modroc down to size, but keep in mind that the modroc will shrink slightly once it’s been put in water. Dunk the modroc in the water for a few seconds, wring out some of he water then place the wet modroc back over the cardboard. Rub the modroc to spread it smoothly over the cardboard. If you have any off cuts use these to fill any gaps round the sides. Leave the modroc to dry completely. When it doesn’t feel damp to the touch it’s ready to be painted. NOTE: You may want to varnish it once the paint has had enough time to dry but it isn’t necessary to do this. What do you think? Anything I’ve missed or could do better? Now I’ve got more space to work in, thanks to my new studio in Pontefract, I can return to a project that I started when I was at the pop up shop in Castleford. I wanted to challenge myself with making 3D Acrylic Paintings of buildings/places. I thought that if I did them of local buildings/places they’d mean more to local people when they saw them as well as to me. 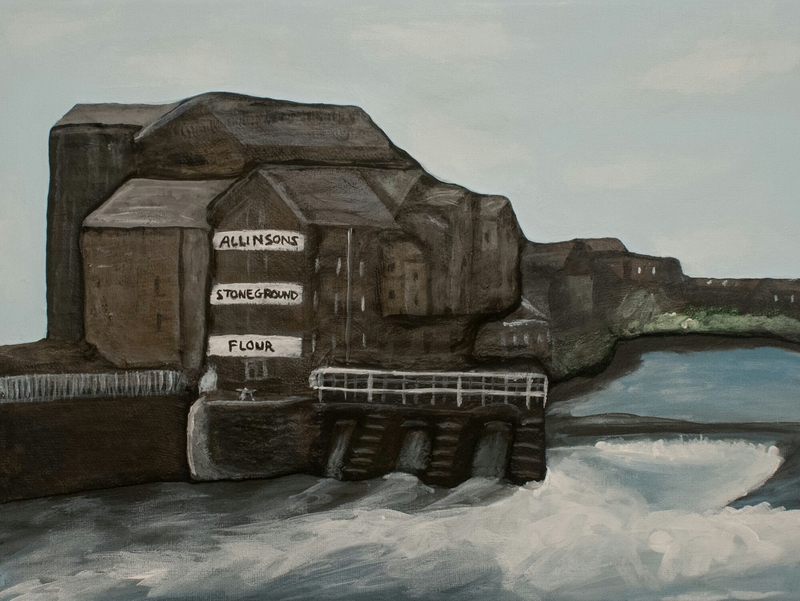 I began with the Allinson Mill in Castleford as it seemed to be popular with people there and it was somewhere that I always liked to look at on my way to and from the pop up shop. 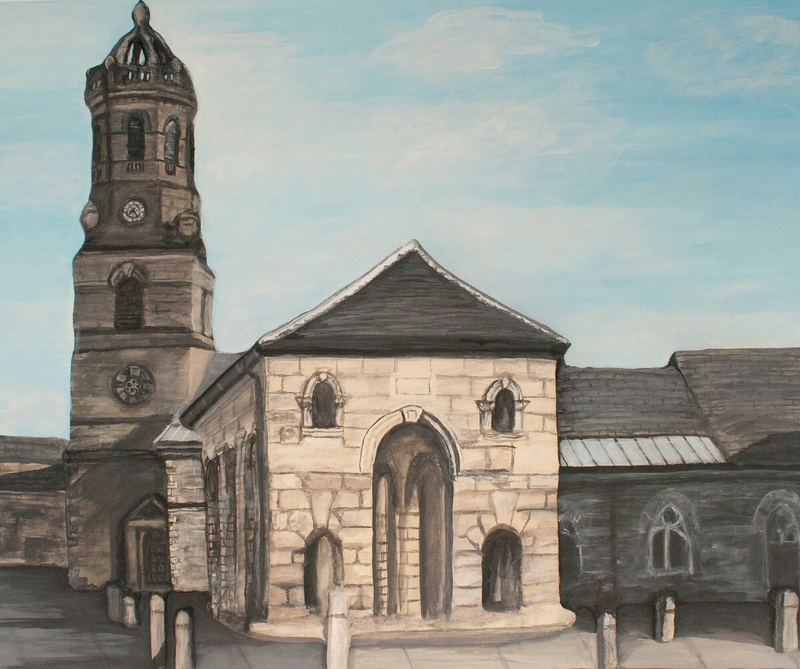 The next place I wanted to make a 3D Acrylic Painting of was the All Saints Church in Pontefract. It’s somewhere I’d always liked the look of and I thought it would be a challenge for me, which it was. Another building I’d always liked the look of was the Buttercross in Pontefract so that was the next one I wanted to make a 3D Acrylic Painting of. The plan now is to find/look at more local buildings/places that I can make 3D Acrylic Paintings of. I’ll then put them together in a dedicated exhibition at my studio and possibly elsewhere locally if I can. If you have any suggestions for local buildings/places for me try or if you have somewhere that is special to you and you’d like to have a 3D Acrylic Painting of it then I’d love to hear from you. I’ll keep you updated with how I’m getting on. Up until the 3rd of October, 2015, four of my 3D Acrylic Paintings will be in a pop up exhibition in the Ridings Centre in Wakefield. In what used to be New Look, next to Created in Yorkshire and opposite the ArtWorld Gallery (who are the people running it), my paintings are being shown along with the work of several other local artists. All the work is available for sale from there directly.